yegsnowfight: We made something, Edmonton. Last Sunday, I witnessed something magical. It was perhaps the most “Edmonton” experience I’ve had since moving to this city in 2012. In October, I was tweeting back and forth with a (then) stranger about having a snowball fight. I had recently watched the Human Scale documentary, in which they showed a spontaneous snowball fight which erupted in Times Square in New York. It looked like so much fun. I couldn’t remember the last time I had a snowball fight, so I was determined to get one going in Edmonton with some friends. Soon after our twitter conversation, in early November, Jeff Chase and I decided to meet for a drink and talk about having a snowball fight. I remember us talking about how it would be tough to wrangle up 50 people for a snowball fight, so we decided to get our idea up on a Make Something Edmonton page. We wanted to have a spontaneous snowball fight, similar to the one in New York. We decided to collect phone numbers by email, which we would later send a text message to with details of where and when the snowball fight would take place. We posted the project on Tuesday, November 4th. 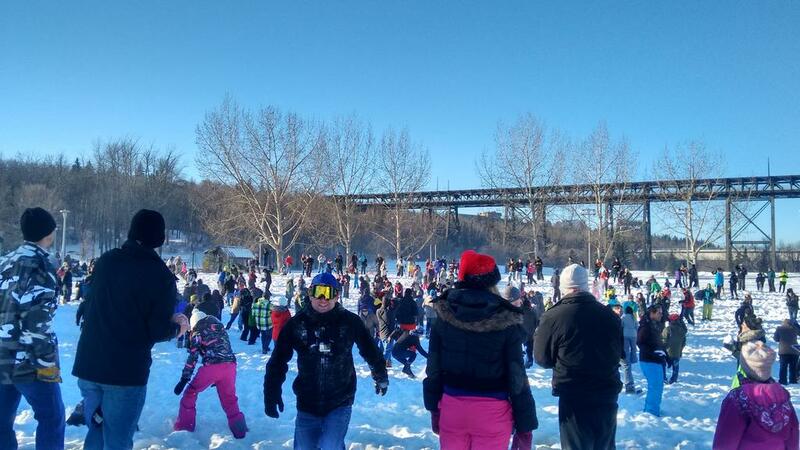 By the end of that week, #yegsnowfight was trending on twitter in Edmonton. We had numerous inquiries from all of the media outlets in Edmonton. Emails were STREAMING in. I remember watching our gmail account and seeing new emails fly in by the second. It was unbelievable. It’s safe to say that neither Jeff nor I anticipated the idea getting so much traction. We spent the next week or so speaking to newspaper journalists, television reporters, and radio hosts about #yegsnowfight. We even had coverage in Calgary. We thought that the emails would stop coming in when we reached around 1000 numbers… Nope. Pretty much right up until we announced the event last Saturday, emails were still rolling in. I think our final count was around 3000 numbers. Our Facebook post was seen by about 27 000 people. When we announced the event on Saturday, #yegsnowfight was trending nationally on twitter. 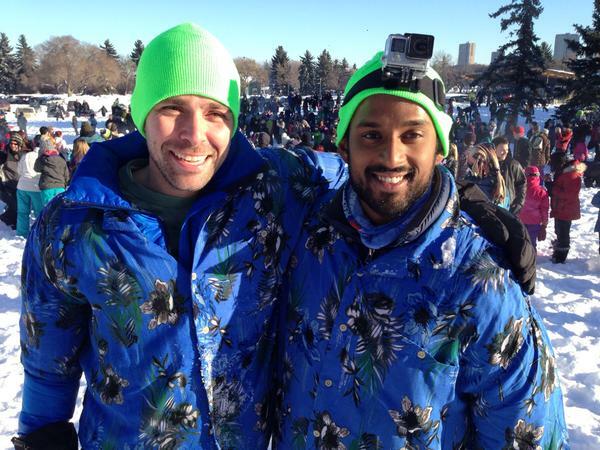 I personally think #yegsnowfight demonstrated the positive community building potential of social media – I learned a lot about the application of social media in the process of planning and promoting the event. The event itself was amazing. People of all backgrounds came out. There were toddlers, teens and adults who showed up with food bank donations in hand and smiles on their faces. We managed to fill a van full of food for the Edmonton Foodbank! Everywhere I looked, people were smiling, laughing and throwing snow. At one point, I got a little tap on my arm. I turned around to be completely covered in snow by a 5 year old girl. The look of mischief on her face made my day. If you want to see some amazing photos of the event, check out Make Something Edmonton’s Facebook photo album here. 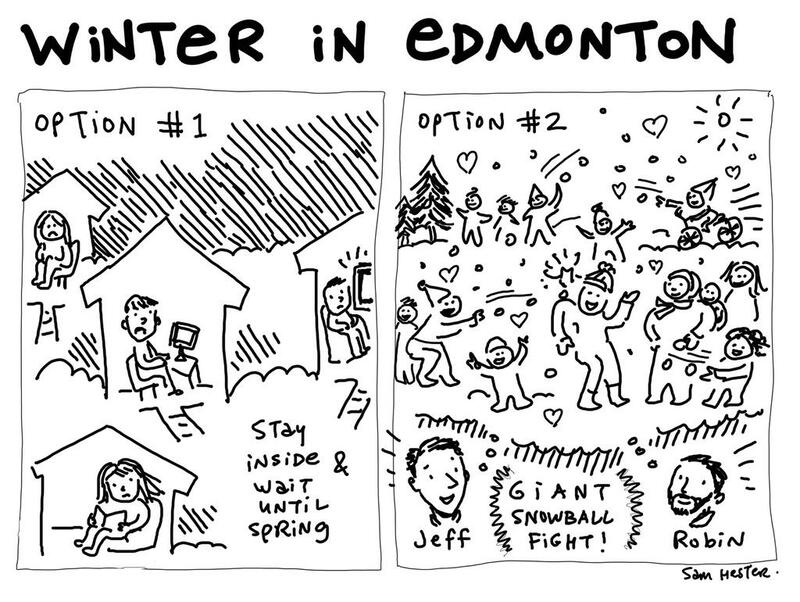 The beauty of #yegsnowfight is that it became its own movement. Jeff and I just put an idea out there, but it was Edmonton that made it what it was. Edmonton showed the rest of the world that it was a city that likes to have fun; a playful city. This interesting Guardian article talks about the Playable City Movement and states that “cities that play together, stay together”. 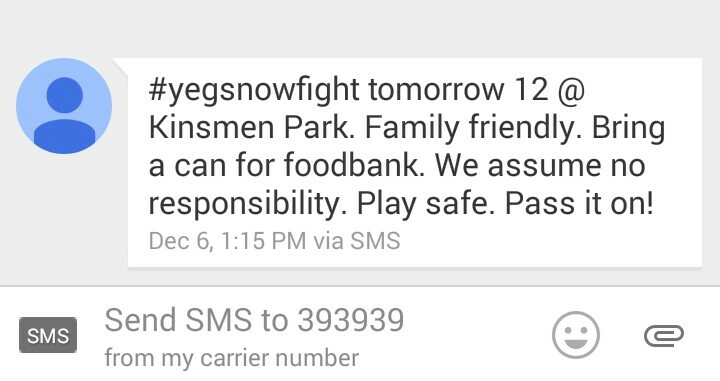 Reading that excerpt makes me think about #yegsnowfight. It was the collective action and desire of Edmontonians to engage in a public activity that brought joy. It was more than just a snowball fight. It was an opportunity for strangers to connect and have fun together. #yegsnowfight facilitated a social connection for me too. Prior to #yegsnowfight, I didn’t know Jeff. Working with him on this project showed us that we actually have a lot in common. We’re friends now. He’s an amazing person and I’m grateful for my new friendship. I’m currently working on a project that addresses social inclusion, and I’ve been trying to wrap my head around how to go about doing it. It’s a complex issue and there is no one way to address the challenge. Interestingly #yegsnowfight accomplished, in an organic fashion, what I’ve been working towards. And I had nothing to do with it. Edmontonians created that inclusive environment themselves. It was awesome. Following the snowball fight I read an Edmonton Journal article, and one part really warmed my heart. One of the #yegsnowfighters, Clement Sitima, came to Edmonton from Zambia three years ago. He brought his whole family. It was his first snowball fight ever. He was quoted as saying “We have to embrace the winter and this is the best way we can embrace it”. That right there made it all worth it. #yegsnowfight made me proud to be an Edmontonian. This is a fun-loving, winter-embracing, community oriented city and I am so happy that I live here. We made something, Edmonton. Thanks.